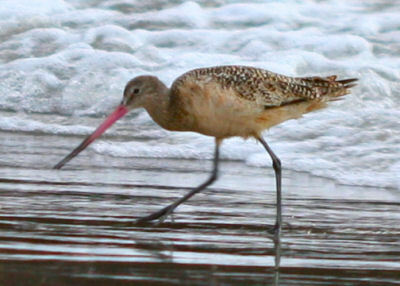 Of all the birds one can see in southern California there is one that is a bit more special than the rest. The Island Scrub-Jay (Aphelocoma insularis) is that bird. Not just because it has a larger bill and brighter, more intense colors than the everyday Western Scrub-Jay, but because it only can be found on Santa Cruz Island, the largest of the Channel Islands off the California coast. 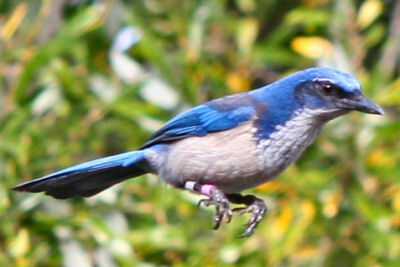 It, along with the Florida Scrub-Jay, was determined to be a species in its own right in 1996 when the American Ornithologists’ Union split the Scrub Jay into three species. Daisy was surprisingly eager to accompany me on the trip to find the Island Scrub Jay, lured more by the hour-long boat ride to an almost completely undeveloped island than by the chance to see a very cool bird. We drove up to Ventura, home base of Island Packers, the tour company that provides boat service to Santa Cruz Island, on Monday to avoid the long drive through Los Angeles rush hour traffic on Tuesday morning. 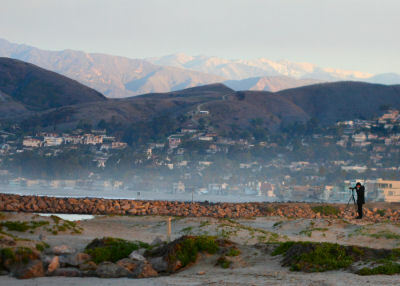 Before checking in to our hotel we visited the breakwaters and beach at Ventura Harbor in the fading daylight. 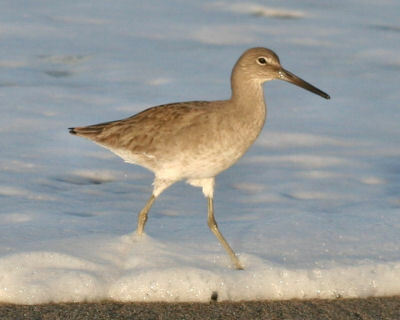 In addition to the birds above we also spotted Willets, Black and Ruddy Turnstones, many Brown Pelicans, Ring-billed and California Gulls, Surfbirds, Black-bellied Plover, Brandt’s Cormorants, Surf Scoters, Horned and Clark’s Grebes. I was also very frustrated by hearing, but not seeing, Black Oystercatchers, which, if I could have found them, would have been a lifer. But the sun went down and Daisy and I had to not only check into our hotel and get dinner but find provisions for the next day’s journey. We were up bright and early Tuesday morning in our king-sized suite that we were put in for regular price because it was the last room they had available at the Holiday Inn Express not five minutes from the boat. We packed up and headed for the harbor to get an hour or so of birding in before 8:15 when we had to check in at the dock. I was pleased to meet a young birder from Massachusetts named Ian scoping the harbor. He got me on the Black Oystercatchers (whew!) 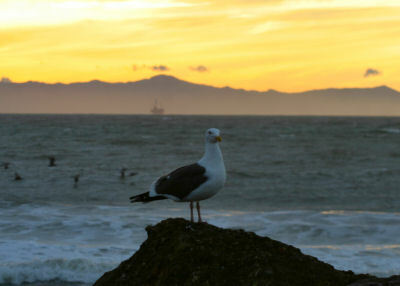 and informed me that I had missed both Glaucous-winged and Mew Gulls that had been flushed by a dog on the beach. Both birds would have been lifers. Ouch. After finding out he would be on the boat we parted ways and Daisy and I tracked down a couple Whimbrels, a Sharp-shinned Hawk, California Towhees, Yellow-rumped Warblers, and other common birds in addition to most of the birds from the previous day, but not the would-be lifers. The ride out on the Islander, our boat for the day, was smooth with no signs of seasickness. Once we cleared the harbor the number of grebes was pretty amazing, with Clark’s and Horned being the most prevalent. A couple of California Sea Lions swam past too. Then, when the ocean bottom dropped and the water turned from turquoise to a deep blue, the really cool birds started to show. 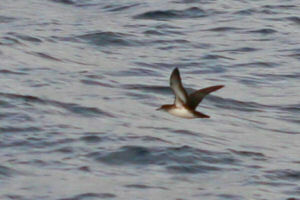 Several Black-vented Shearwaters, a life-bird, went past the boat. 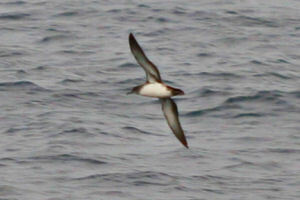 The small shearwaters flapped their wings quickly in a rather distinctive style. Ian spotted a Rhinocerous Auklet which I got very poor views of but I really didn’t have too much time to think about it as a Cassin’s Auklet was next in line (both lifers). 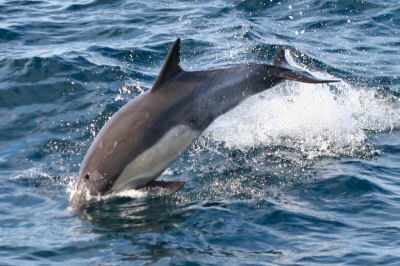 Then we spotted an alcid we couldn’t assign an identity to but by that point we were in the middle of more Common Dolphins than I would have ever thought possible. They stretched pretty much as far as we could see in every direction and the only estimate of their numbers that I give any validity to is “lots,” though crew members gave estimates ranging from 2,000-5,000. It was pretty darn cool, to say the least. The captain steered the boat to stay with the dolphins, accommodating the many non-birding passengers who really wanted to see them. While the dolphins were certainly enjoyable Ian and I wished that we could have done the same with the alcid we couldn’t get (and the flock of four more that Ian spotted while I was busy trying to get the perfect dolphin picture). But, after all, the boat was mainly to get people from Ventura to Santa Cruz, not to provide birders with good looks at little black and white birds on the water. The arrival at the first port-of-call at Santa Cruz, Scorpion Anchorage, surprised us two birders and our non-birding companions when everyone except the four of us and the crew got off the boat! I guess only birders want to go to Prisoner’s Harbor where the Island Scrub-Jays are reputably easier to find and one must fill out a form if one wishes to hike on Nature Conservancy land (the island has only two landowners, the U.S. government and the Nature Conservancy, and Prisoner’s Harbor is at the border between the two parcels). Anyway, the Pelagic Cormorants we spotted en route to Prisoner’s Harbor were a nice addition to the day-list as were the Common Murres we spotted (Ian and I each had one, though I’m not 100% sure on mine). We got off the boat and started looking for the jays. By unspoken agreement we all stuck together, neither Ian nor I wanting to have to endure the boat ride back listening to the other describe the absolutely crushing looks they had while being miserable about having dipped. We shouldn’t have worried. After a short search, and several excruciating minutes spent hearing, but not seeing, the birds, a couple of Island Scrub-Jays emerged from (where else?) 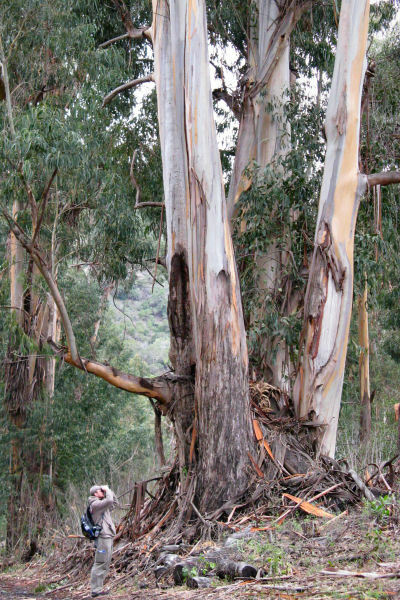 some thick scrub, and one, with five (!) bands on its legs stuck around for pictures. After that, the rest of the day’s birding was anticlimactic. Sure we spotted Orange-crowned Warblers, Allen’s Hummingbirds, Northern Flickers, and Song Sparrows, all possible candidates for future splits from their mainland counterparts (though doubtful, I think, as all of those species tend to, you know, migrate, and thus risk intermingling their genes with the mainland population). The scenery was spectacular though, and we truly enjoyed exploring the island. Seeing dozens of Allen’s Hummingbirds buzzing around the top of a eucalyptis was impressive, as was the big flock of Bushtits that made its way past Daisy and me. We were also impressed by the trees. Daisy and I had split off from Ian and his dad after our initial scrub-jay encounter and when we regathered to tell war stories and wait for the boat a couple more scrub-jays hung around being scrub-jays. I watched one catch a bee and pull off its stinger before eating it and another dig up a (previously cached?) acorn and rebury it elsewhere. All-in-all it was a fun four hours on the island. When the boat arrived we were happy to board it, if only for the chance to see more pelagic birds, but sad to leave such a wondrous place behind. I hope to go back someday. The trip back to Scorpion Anchorage and to the mainland wasn’t as action packed as the dolphin-laden trip out had been but we did get better looks at Rhinoceros Auklets and Black-vented Shearwaters, to say nothing of a ton of Surf Scoters and a single female Black Scoter. Back at shore we said our goodbyes and Daisy and I headed back to Temecula through the worst of rush hour Los Angeles traffic, enlivened a bit by a high speed chase in the car pool lane that involved an SUV and seven cop cars (seriously, I’m not making this up). We made it back to Temecula in one piece and slept like the dead. If you go to see the Island Scrub-Jays, good luck! Definitely go to Prisoner’s Harbor: all the literature says to do so and I can’t imagine a more obliging bird that you really want to see. 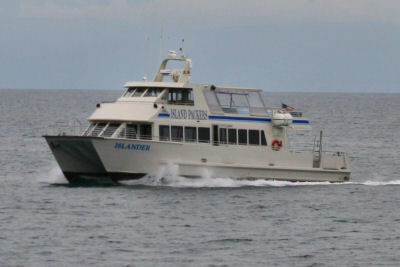 Island Packers runs boats most days but check their site for specific schedules and make reservations. The $46 for a round trip ticket does not include a tip for the crew and you have to provide all of your own food and drink on the island (though the boat is equipped with a fully-stocked galley including coffee and beer). Different times of year will lead to different sightings on the boat ride; apparently both spring and fall can bring amazing spectacles of migrating birds that we didn’t get to see. 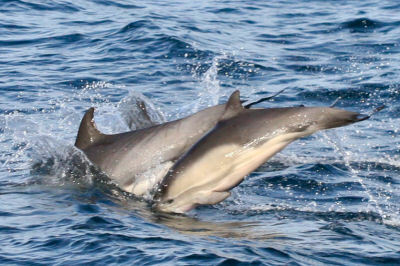 I have no idea how often one sees ginormous pods of dolphins but I can’t imagine it happens every trip. Whatever you see have fun, be safe, and don’t litter on the amazingly clean and beautiful island! 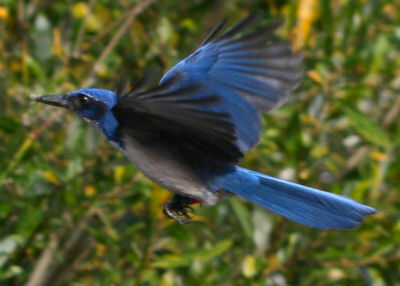 That is truly a handsome scrub-jay. Well done, Corey! What an awesome day! I’m looking forward to a trip there someday… maybe 2009. Great pics. The middle Scrub-Jay looks like it’s perched on an invisible stick. I dig the sunrise pic too. Hey, it was good birding with you. None of my dolphin pictures turned out sadly =/ I should have some ISJA pics up soon though, I’m heading back today. Good luck with the rest of your trip! I am graduate student working on the Island Scrub-Jay. I banded the jay in your pictures(RGB/AP). I caught him on October 6, 2007 and tested him for West Nile Virus which turned up negative. Anyways, that is great you saw him. This is a response to Ian’s statement. 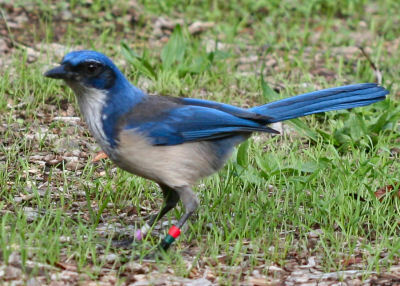 The Island Scrub-Jay’s Alpha code is ISSJ not ISJA ( that would mean Island Jay). All the Best. We live in Santa Cruz County and have some of these Coastal Scrub Jays that litteral stalk our Cat’s every movement screamin “Ike”. The bird seems to intuitively know where the Cat is in the house at any given movement, and the ninstant the Cat goes to the front step or the back deck appears out of nowhere to Harrass the Cat. I’m looking for a voice activated Owl to give the Cat some piece of mind. 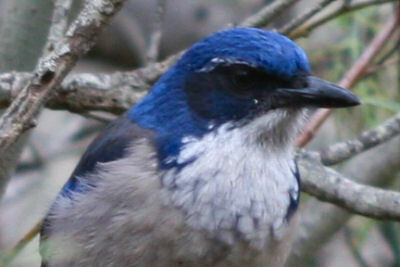 I just returned from Santa Cruz Island, I got an Island Scrub Jay – but your photos are far superior! Awesome!